Lawrence Eugene “Gene” Rhyan, age 85, passed away from congestive heart failure on February 24, 2019 at his home under the care of his Family and Hospice of the Valley. Gene was born October 16, 1933 to Francis and Julia Rhyan in Oakes, ND. He was raised there with his two brothers and sister. 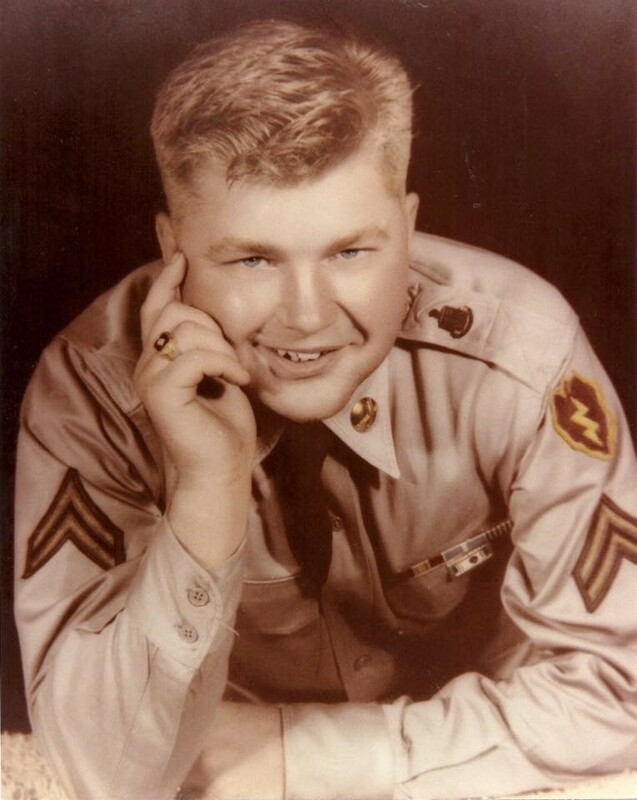 He left Oakes and joined the Army on June 3, 1953. He served in the Korean War, Hawaii and Fort Carson, CO. He was discharged June 29, 1956 and then served in the Army Reserves for 8 years. In 1956 he met his wife Rosella Wilson when they both worked at Morton Frozen Foods in Webster City, IA. He and Rosella were married on February 23, 1957 in Elk Point, SD. They had 3 children, Roxanne, Jean and Monty. Gene worked over the years at Lehigh Sewer Pipe & Tile in Lehigh, IA. He was the manager of Earl May Garden Center in Ottumwa, IA. In 1969 the family moved to Riverton, WY where he worked in the Uranium mines. In 1974 the family moved to Gillette, WY where he worked for Reeves Concrete. He went on to open his own carpet cleaning business – “Gene’s Carpet and Wall Cleaning”. This was a family business as Rosella booked the appointments and was the bookkeeper. Monty worked with his Dad; Jean and Roxanne assisted as needed. He sold his business when he retired. After his wife Rosella’s death in 2007, he moved to Arizona in 2010. Growing up in North Dakota and living in Iowa and Wyoming, he always looked forward to living in Arizona. After living in Arizona, he met and later married Betty L. Orfald in 2011. Gene loved God, his Family and people. He was friendly, kind, generous and always had a smile for family, friends and strangers. He was known as the “Candy Man” at his Wyoming Church of Christ. He was so loved, that someone made a special bag for him to give out candy so he could give out more candy than would fit in his pockets. He loved living in Arizona with all his friendly neighbors. Preceeding him in death was his father Charles Frances Rhyan, mother Julia Louisa (Torrence) Rhyan, wife Rosella Marie (Wilson) Rhyan, daughter Jean Marie (Rhyan) Prieb, brother Ronald Christ Rhyan, wife Betty L. Orfald. Gene is survived by daughter, Roxanne (Donald) Botic of Saint Peters, MO, son Monty Rhyan of Apache Junction, AZ, brother Dennis (Sandy) Rhyan of Maricopa, AZ, sister Gloria (Karl) Kirchner of Rockford, IL. He had four grandchildren: David (JiYoung) Berry, Stephanie (Dave) Newcomb, Christina (Keith) Wright and Tim Rhyan. He had 9 great-grandchildren, Ethan, Isaiah, Abby, Eli & Gracie Wright, Olivia Berry, Jonathan, Jennifer & Hannah Newcomb and several nieces and nephews. The memorial service will be March 1, 2019 at 10:00 a.m. at the Sun Valley Church of Christ, 1015 N. Recker Road, Gilbert, AZ 85234. Lunch will follow. Memorials may be given to the family to be designated at a later date (Roxanne Rhyan Botic, 167 Siena Drive, Saint Peters, MO 63376). You have our deepest sympathy. May your memories of him give you comfort and peace. Are thought and prayers are with you for loss of your loved one. Sorry for Your loss. Praying for Tim & family.